It turns out these words aren’t just applicable to our day and age, but also to a galaxy far, far away. You see, Return of the Jedi dramatizes these verses of scripture beautifully through Luke Skywalker’s love for his father, who is seemingly the most evil man in the galaxy. But Luke looks for the good in him and he finds it by being willing to sacrifice his life rather than give in to his anger. Luke is constantly running off to help people he cares about in the first two Star Wars films in the Original Trilogy. That’s one of his defining character traits. In Star Wars, as soon as he realizes his aunt and uncle are in danger of being killed by Stormtroopers, he races home to try to save them. Obi-Wan Kenobi warns him that it’s too dangerous, but he doesn’t even pause to consider that. He acts on instinct, and his instinct is to help. Unfortunately, he’s too late and his aunt and uncle have already been killed by the time he arrives. Later, when he discovers that Princess Leia is being held captive aboard the Death Star, he immediately hatches a plan to rescue her. Han Solo doesn’t want to help, but Luke manages to persuade him by appealing to his self-interest. His altruism even begins to rub off on Han because by the end of that film, Han comes to the rescue right in the nick of time to save both Luke and the entire Rebellion from certain doom. And then in The Empire Strikes Back, Han puts himself in grave peril to try to rescue Luke from a giant snowstorm. Luke returns the favor by hurrying to Bespin after seeing a vision of Han and Leia in terrible pain at the hands of Darth Vader. 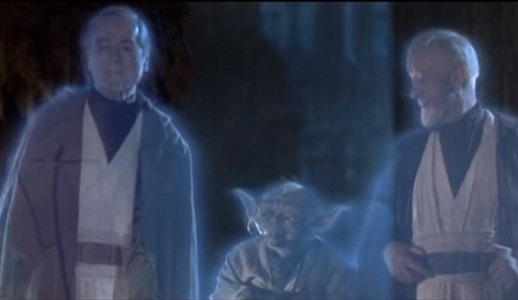 Obi-Wan and Yoda both warn him not to go, but he once again doesn’t hesitate to risk life and limb if only he can get there in time to save the ones he cares about. This time his reckless charity actually costs him a limb, but he barely escapes with his life and the lives of most of his friends. In Return of the Jedi, Luke and his friends take the time to devise a far more cunning plan to rescue Han from Jabba the Hutt. Clearly, this is a much more mature Luke Skywalker who doesn’t just rush headlong into life-and-death situations. He takes his time and considers his options so that he won’t underestimate his opponents, but instead make them underestimate him. When Luke returns to Yoda he learns from him and Obi-Wan that the only way to truly become a Jedi Knight is to confront Vader once more. Luke says he can’t kill his own father and Obi-Wan responds that, in that case, the Emperor has already won. But Luke isn’t having any of that. He sees the good in Vader. Obi-Wan declares that Vader was seduced by the Dark Side, clarifying his earlier statement that he betrayed and murdered Luke’s father. “He’s more machine now than man. Twisted and evil,” Obi-Wan explains. Luke realizes the only way to reach his father Anakin Skywalker. If Vader was seduced by the Dark Side, Luke must show him unconditional love. Vader betrayed and murdered Anakin? Luke will be absolutely loyal and faithful to Anakin, even at the cost of his own life. 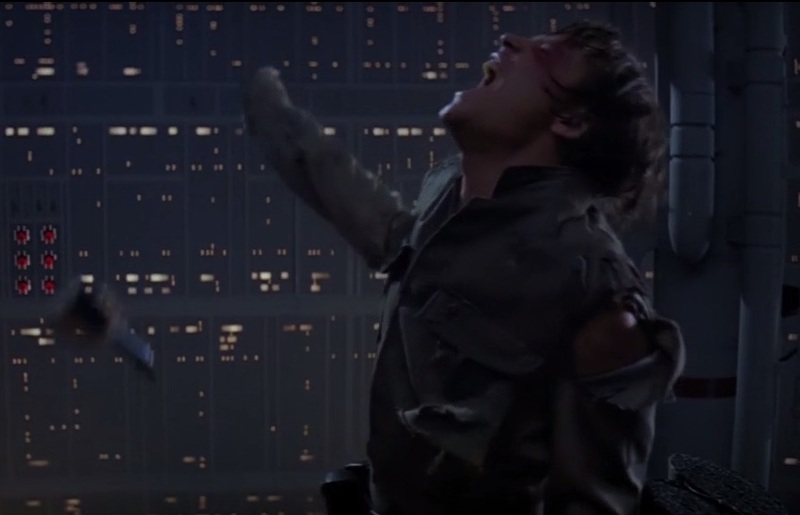 This is what Luke must do to straighten out his twisted, evil father and help him to destroy Vader and save Anakin. 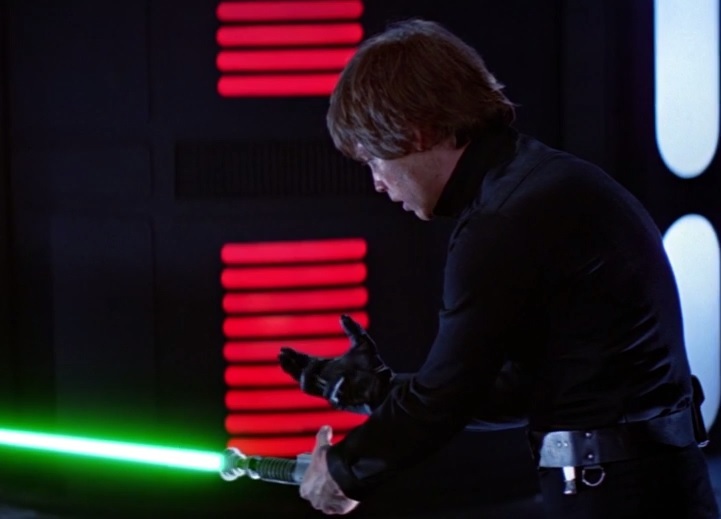 When Luke comes face to face with the Emperor, he spells out that the Emperor’s overconfidence is his weakness. The Emperor counters that Luke’s weakness is his faith in his friends. In the end, Luke is proven right while the Emperor is proven wrong. The Emperor didn’t consider Vader one of Luke’s friends, and he was right at that moment. But Luke was counting on his love for his father to transform Vader from his enemy into his friend when the time was right. Luke does lose his temper for a minute, but, again, that is only because Vader threatens Leia. Luke acts on instinct, and his instinct is always to help and protect his loved ones. 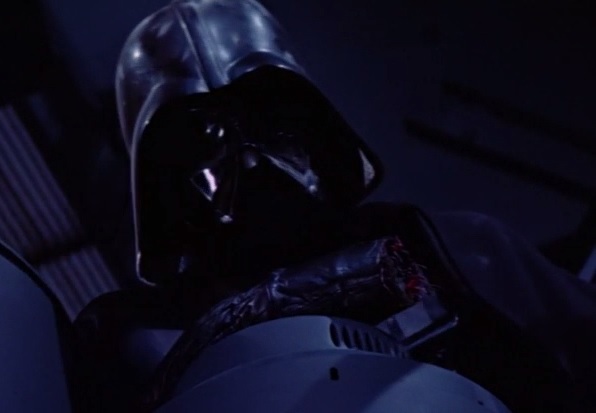 He lashes out in anger, but as soon as he realizes he’s no longer defending Leia, but betraying her and himself to the Dark Side, he pulls himself back and adamantly refuses to do what the Emperor wants him to do. The Emperor (and, by extension, Vader) wanted to use Luke’s abilities for his own evil ends. He cursed Luke and hated him when Luke chose the path of a Jedi and refused to kill his father. And then he proceeded to persecute Luke with powerful bolts of electricity in the hopes of making him suffer an agonizing, drawn-out death. This certainly fits with the scriptural verses I quoted at the beginning. Despite all of that, Luke refused to hate him. His love couldn’t reach the Emperor, who is so obsessed with power and evil that he can never find redemption. But Luke’s love could be felt by a conflicted man who wanted to believe that he was doing the right thing. Luke appealed to Vader’s sense of justice and mercy. Vader could see that what the Emperor was doing was completely unjust and he was murdering a defenseless young man in cold blood. And when Vader couldn’t take it anymore, he was impelled to action by his wounded conscience. All of Luke’s anger and abilities would have proved no match for the Emperor. But the one thing the Emperor attached no importance to – Luke’s faith in his friends – proved more powerful than the Force itself. As Abraham Lincoln famously declared, “Do I not destroy my enemies when I make them my friends?” We all have enemies, those who wish to harm us in one way or another. Don’t believe me? Share a political opinion on social media and people will come out of the woodwork to offer an angry response. If you respond with anger to these supposed enemies you will only inflame them further and stoke the fires of their indignation. But what if you instead respond to them with patience, kindness, and humility? What if you show love to people who disagree with you? Perhaps they might be a little more open to listening to you. In everything I do and say, I strive to do unto others as I would have them do unto me. I make mistakes here and there, but I think you will find, at least online, that I have always been quite agreeable. I have sometimes been rather facetious and sardonic in my tone, but for the most part I attempt to really mean everything I say like it’s under oath and I could be called to account for even the smallest assertion I make. It takes more courage to love than to hate. If someone hurts you, don’t hate them. Refuse to give them your anger, but shower them with forgiveness and love, and they will hopefully realize their own actions have been less than honorable and they will want to change. If someone disagrees with you on a principle that you hold dear to your heart and you simply cannot believe that a good, decent person could ever, in good faith, disagree with you about it, don’t hate them. Be patient with them and attempt to understand things from their perspective. Then share your own perspective. There are so many friends to be gained out there by simply recognizing that they are not really your enemies at all. They just need your love to show them how to be better. “Love your enemies, bless them that curse you, do good to them that hate you, and pray for them which despitefully use you, and persecute you.” This, my friends, is the formula for a happy life. If you will love people who don’t deserve it, many of them will want to improve so that they will deserve to be treated the way you have treated them. May the force (known as Christlike love) be with you. This entry was posted in Random Stuff and tagged 1980s, anakin skywalker, bible, darth vader, films, jesus christ, kindness, love, luke skywalker, movie review, movies, relationships, return of the jedi, science fiction, scriptures, sequels, star wars. Bookmark the permalink. Great review and exploration of the Christian themes in RotJ! I’m convinced we all love a good redemption story because deep down we want someone to redeem us from our own actions (and He has). Nice review. You’ve got a really great attitude. You sound like you could be a writer/man of the cloth. why even care about Jedis? I mean, look, I’ve eaten raw turkey out of the garbage every year. My shoes don’t tie themselves because of the dead birds. I’m not sure I understand your metaphor. My point in this article is simply to draw a comparison between a fictional story and real-life situations. When applied in everyday life, everyone can benefit from this principles of forgiveness and kindness.